Microwaves are a staple for workers on the go and college students looking for late-night snacks, but in the home, they’re often relegated to a counter or above the stove. However, that might be changing as more and more homeowners customize their kitchens. The convenience of microwave heating is frequently undercut by the location of the oven itself. Traditionally, the microwave sits on a countertop near an electrical outlet, or is installed at eye level over the stove, Kavanaugh says. Both locations pose some difficulties for users, despite the microwave’s reputation for maximum convenience when it comes to heating food. A countertop microwave takes up room and results in lost workspace and the wires can clutter the counter. A microwave positioned above the stovetop calls for particular care, since a user must reach up and into it to retrieve super-hot food. A microwave drawer eliminates both potential drawbacks. As a built-in device, there are no wires to worry about. And the drawer sits waist-high, inside the cabinet; it’s easier to lift hot food, with less risk of injury from spilled liquids. The design is also much safer for kids, who won’t need to climb on a chair to move dishes down from above their heads. Another attractive aspect of the microwave drawer is the cooking mechanism itself. A standard microwave uses a turntable to rotate a dish while microwaves pass through it and agitates the water molecules in the food. But as anyone in search of hot food can attest, this method doesn’t always result in an evenly heated meal. The microwave drawer attempts to combat this through an internal fan that rotates around the food. Kavanaugh says that this allows for more even distribution of the microwaves that cause the cooking, and thus more evenly heated food. 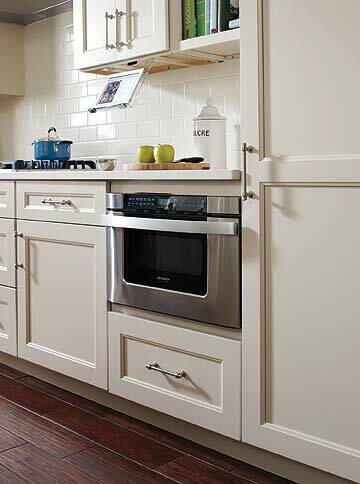 A microwave drawer can range in price from $900 to $1100, and that’s without factoring in cost of installation. As a result, someone who already has a traditional microwave isn’t likely to replace an old or broken countertop or stovetop unit with a new microwave drawer. However, when it comes time for a homeowner to remodel the kitchen, a microdrawer may find its way onto the shopping list, along with refrigerator drawers and warming drawers that have become hallmarks of luxury kitchen.